When replacing old Double Glazing with new, high-performance windows, A-Rated Home Improvement’s range of uPVC and Aluminium products are a cost-effective solution when wanting to renovate your home’s visual aesthetic and increase comfort. With thermal insulation, increased security and better energy efficiency, our styles do it all, and come ‘A’ rated by the WER as standard. Whether you’re looking for immaculate white Casement, Tilt & Turn, Sash, or Bow and Bay units; or maybe something a little more unique, we’re sure to have the ideal replacements for you! We are also proud to supply Triple Glazed units, offering even more Thermal Performance and greater Energy Saving properties than their Double Glazing counterparts. Enquire today to see how this Glazing Technology can benefit your home. Helping people save money on their energy bills, upgrading your windows to triple glazing ensures heat will be kept in to result in a warmer home. Simple yet effective, casement windows are the UK’s most popular choice of replacement window for their ability to tie any home together. Residence 9 windows provide the aesthetics of 19th century timber flush sash designs with modern features and performance. Sleek, clean and boasting slim sightlines, aluminium windows provide uninterrupted views with increased strength that can accommodate more glass. A series of casement windows capable of providing 180° views from within the home, bay and bow windows flood the space with lashings of natural light. 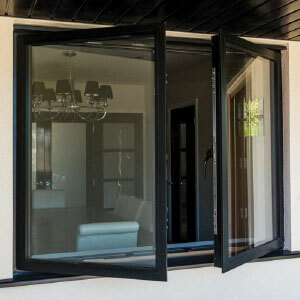 Providing great ventilation whilst being able to be cleaned from the inside of your home, tilt & turn windows can tilt inwards as well as open traditionally. Replicating the look of traditional sash windows with separate top and bottom sashes, mock sash windows provide great performance thanks to high quality uPVC.